namaḥ (n/V) – adoration, homage; sura – a god, divinity, deity; sara – fluid, liquid going, motion a waterfall; ākāra – form, figure, shape, stature, appearance, gesture, expression of the face; hariṇa – [adj] fallow, pale, yellowish, green, [m] a kind of antelope; aṅka – hook, bend, flank, esp. of the body, groin, lap, side, proximity, mark; kara – a doer, maker, causer, doing, making, causing, producing; sthite (f/V) – standing, staying, situated; tāra – [adv] all-pervading, esp. of a sound, i.e. loud, high, shrill; or of light, i.e. shining, radiant; tārā – a fixed star, asterism, Tārā; dvi – two; rukta – [PPP of ruc :] shine, be bright, make a show, appear beautiful or good, please, delight in, long for; phaṭ – [a holy sound]; kāraiḥ – [m/I/pl of kāra, term used to signify a letter, sound or indeclinable word]; aśeṣa – no rest or remainder, [adj] entire, whole; viṣa – poison, venom, bane, anything actively pernicious; nāśini (f/V) – perishing, perishable, [ifc] destroying , removing; viṣanāśini (f/V) – poison-destroying, any antidote. You dispel all poison without exception. The eighteenth homage is to Maja Chenmo,Tib the “Great Peahen”, who averts and pacifies poison. She is as white as the moon, and sits on a blue lotus. In her left hand, she holds a full moon marked with a rabbit, which is the shape of the ocean of nectar of the god realm. With her radiance and her chanting of the mantra, OṂ TĀRE TUTTĀRE TURE SARVA VETRA TĀRE PHAṬ SVĀHĀ, which has two TĀREs and a PHAṬ syllable, she clears all poisons, both animate and inanimate, without a trace. 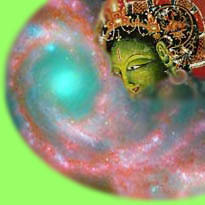 Generally, all obstacles arise from poisons, and the base of all the animate and inanimate poisons is our afflictions. She clears all the poisons of sentient beings without a trace with the medicine of the truth of reality.